Over two fair days in Hobart, OWS Senior Forecaster Angelo Portelli attended many and varied presentations at the AMOS Conference held at Grand Chancellor Hotel on February 13-14, 2014. The Thursday morning sessions provided excellent presentations by Sally Lavender on the influence of sea surface temperature on Severe Tropical Cyclone Yasi. Also notable was the presentation of evidence of low-level volcanic ash clouds during the 2008 Chilean eruption by Andrew Prata. The session attended on Thursday afternoon was the “The weather and climate of the Maritime Continent region in observations and models” including a presentation by Jules Kajtar on the importance of the atmospheric bridge on the Indo-Pacific climate feedback interactions. Another interesting presentation was also provided by Eric Oliver on the Madden-Julian Oscillation and the Gulf of Thailand sea level and circulation variability. After an excellent dinner at MONA (Museum of Old and New Art) the previous night, Friday brought new sessions on “Waves and Coastal Inundation” and “The Structure, Dynamics and Predictability of High Impact Weather”. An update on the operational wave model in the Bureau of Meteorology was provided by Aihong Zhong in the former session, along with an excellent presentation by Joanna Burston on the potential for forecasting of coastal inundation from Tropical Cyclones using case studies from QLD in the latter session. The latter session included two more interesting presentations specific to tropical cyclone eyewall replacement cycles and then dynamical sensitivity of tropical cyclones to SST. Also, an update on the U.S. CLIVAR Hurricane Working Group activities was provided by Kevin Walsh. The Australian Meteorological and Oceanographic Society (AMOS) is an independent Australian society that supports and fosters interest in meteorology, oceanography and other related sciences, providing a forum for people with a common interest, and by publishing relevant material. Early trials of the WRF ARW high resolution mesoscale atmospheric model developed by Dr Simon Caine specifically for squall forecasting in the Gulf of Thailand have shown great promise with convective cells being accurately modelled both temporally and spatially when compared with available radar data. This model is in the early stages of development and further refinement of the model’s convective parameterisations are expected to yield even better results resulting in more accurate squall forecasts for OWS clients in the Gulf of Thailand as the 2014 squall season begins from early May. The Advanced Research WRF (ARW) is one of the two dynamical core versions of WRF. For more information on OWS modeling capabilities, please contact us through our Contact link. OWS Weather Forecaster, Alistair McKelvie, attended the WRF Tutorial and Workshop held at the University of New South Wales in Sydney on February 24-28, 2014 to keep up to date with the model system, latest developments, evaluations and applications. The event was run by members of the University Corporation for Atmospheric Research (UCAR), a consortium of more than 100 member colleges and universities focused on research and training in the atmospheric and related Earth system sciences. The WRF tutorial and workshop is the first to be held outside of the USA. The four day tutorial explained the model system, how to run, customize, and use the output. The workshop was held on the final day which included talks from visiting UCAR members, local academics and students about research relating to WRF and its applications. Offshore Weather Services have already set up WRF atmospheric model grids over the entire South China Sea, Gulf of Thailand, NW Shelf and Bass Strait in Australia. Offshore Weather Services was commissioned by UTEC and Saipem to provide onsite weather forecasting support during the installation of the Zawtika topside in the Gulf of Mottama, Myanmar. The Zawtika Project is a gas field development project between partners PTTEP International Limited (PTTEPI) as operator and Myanmar Oil and Gas Enterprise (MOGE). The ZPQ is an integrated platform which combined both natural gas processing facilities and living quarters into a single platform. 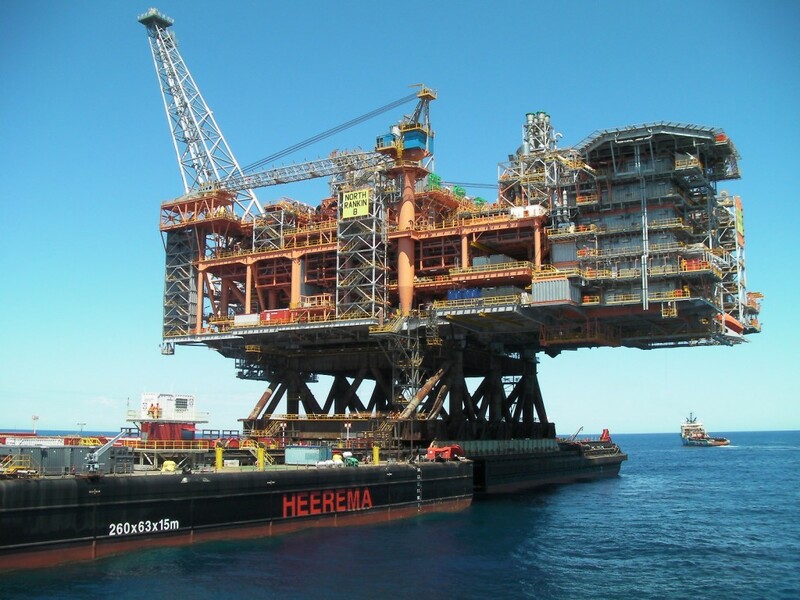 The topside weighs 16,500 metric ton (MT) and is one of the largest topside structures installed in South East Asia. 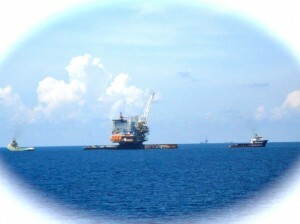 It was designed and constructed by SOME (Singapore) with Saipem engaged for the installation. OWS Director and Senior Forecaster Eric Tiong was the Meteorological Consultant on board the support vessel PW Natuna and worked directly with and advised the operations personnel responsible for the successful float over which occurred during the early morning on 21st October 2013. Offshore Weather Services have recently conducted the PTTEP 2013 Tropical Cyclone Briefings and assisted in the Typhoon Exercise in preparation for the 2013 Tropical Cyclone Season in the Gulf of Thailand. Offshore Weather Services senior forecasters Peter Wellby and Aila Aguilar took turns and went around the PTTEP assets in the Gulf of Thailand to conduct the Tropical Cyclone Briefings. The briefings covered the tropical cyclone risk in the region, TC forecast tracks and warnings issued during cyclone occurrences and the PTTEP TC Emergency Response Zones. A ‘Tropical Cyclone Exercise’ followed. The Gulf of Thailand normally has one to two Tropical Cyclone threats each year, occurring mainly in the months of October to December. The region has been affected by 23 tropical cyclones for the past 21 years with 17 tracking across the gulf at varying intensities. Super Typhoon Haiyan (OWS32N13) with packing winds of 140kt is now crossing central Philippines. It is expected to cause high storm surges and massive damage over the region. Super Tyhpoon Haiyan has already battered Palau Island and parts of the Micronesia yesterday and is now ripping through the Visayan islands in the Philippines. Haiyan is expected to be west of northern Palawan early morning on the 9th and should cross the central South China Sea to make its third landfall over central Vietnam on the 10th. Offshore Weather Services, business partners, academic community and clients celebrated the opening of the newly renovated OWS office in Melbourne on 3 May 2013. The office was under construction for nine months and now features a modern and environmentally friendly design. 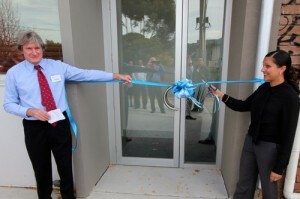 Monash City Mayor Micaela Drieberg graced the occasion and cut the ribbon. Also attending were Vadim Anokhin from Woodside, Prof Alex Babanin from Swinburne University, Prof Kevin Welsh from University of Melbourne, representatives from Environmental Systems and Services, Mr Gary Flannigan, the Architect of the renovations: Richard Barrack and the builder Mr Andre Garnaut. Following the ribbon cutting ceremony, the Mayor and guests were given a tour of the new office. “First of all a big THANK YOU to you all for attending this very special occasion. For those that have been with the Company from the beginning this is indeed a very welcome period in the history of Offshore Weather Services. I would like to extend a warm thank our wonderful culturally diverse and very talented staff that have put up with less than optimum working conditions for too long a time. Last but certainly by no means least I would like to thank the Mayor of Monash City for gracing us today and making this indeed a very special occasion” said Mr Peter Wellby, Chairman of the Board of Directors. The Melbourne office is the main operations centre of OWS with satellite offices and branches in Perth, Singapore, Kuala Lumpur and Manila. Marine and Aviation Weather Forecasting Specialists. OWS Philippines was officially launched by Mr Peter Wellby, Chairman of the Board of Directors of OWS Australia with Mr Gao Hongmin, Managing Director of OWS Asia, on 19 April 2013 at the EDSA Shangrila Plaza Hotel in Ortigas Center, MandaluyongCity, Philippines. Present during the launch were Mr James Hogan, Operations Manager of Otto Energy, Mr Jaime A. Bacud, Exploration Manager of PNOC Exploration Corporation, Mr David R. Baladad, VP for Operations of South China Resources and Ms Alma D. Roxas, Corporate Project Manager of Alternergy, to name a few. 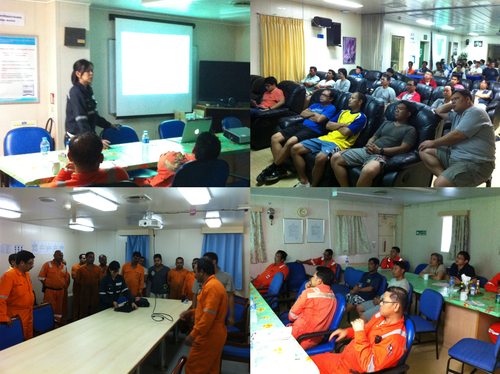 Peter and Gao presented and discussed the meteorological and oceanographic products and services as well as the vast experiences of Offshore Weather Services in Southeast Asia and Australia including its active involvement in the Malampaya float over wherein Peter was the onsite meteorologist. Dr Nilo is looking forward to providing specialized weather forecasting and climate consultancy services to the energy sector in thePhilippines. At present, OWS is providing site-specific weather forecast for the Palawan Galoc oil field in western Philippines. OWS has recently commissioned a new Weather Research and Forecasting (WRF) atmospheric model grid encompassing the entire South China Sea with a higher resolution sub grid covering the important offshore oil & gas industry region off the coast of northwest Borneo. The early use of the model has shown some promising results. One example includes the WRF model identifying a local affect causing a plume of stronger winds near Palawan which has never been identified on coarser global atmospheric models. This local generation of winds was only previously noted by personnel offshore in certain synoptic situations, but could not be correlated with coarse global atmospheric modelling. It is now possible to forecast the region and length of time this wind, and subsequently generated waves, may affect clients working in the region. The WRF Model is a next-generation mesoscale numerical weather prediction system designed to serve both operational forecasting and atmospheric research needs. It features multiple dynamical cores, a 3-dimensional variational (3DVAR) data assimilation system, and a software architecture allowing for computational parallelism and system extensibility. WRF is suitable for a broad spectrum of applications across scales ranging from meters to thousands of kilometres. For more information on OWS modelling capabilities, please contact us through our contact link. Offshore Weather Services provided weather forecasting services during the installation of Woodside’s North Rankin B platform. The North Rankin jacket was installed in September 2011 with the topsides installed by float over several months later in March-April 2012. The North Rankin B topside float over was the heaviest ever conducted in the southern hemisphere and required the services of the world’s biggest barge the Heerema No 1. Offshore weather services were engaged by Heerema Marine Contractors Ned BV to provide weather forecasting services during the project which also required an on-site consultant to provide daily briefings with the client, as well as issuing the site specific weather forecasts. In addition Heerema requested the model spectral data. Five sets of spectral wave data (each one produced from a different global or high resolution mesoscale atmospheric model) were uploaded to the client twice daily in order to run the client’s in house barge motion simulation software. These simulations provided predictions of the motions and accelerations of the mating units of the North Rankin top sides to determine if the motions were within the limits acceptable to performing the float over operation. These predictions were then compared with measured data to provide increased confidence that the weather window for the operation was well within project limits. Peter Wellby, Offshore Weather Services Operations Manager and Certified Consulting Meteorologist was the onsite Duty Forecaster during the Heerema operations and was based on the HLB Hermod during the jacket launch, upending and placement on the seafloor. It was a reunion of old friends as Peter had last stood on the Hermod some 30 years earlier when the heavy lift barge was working in the North Sea.